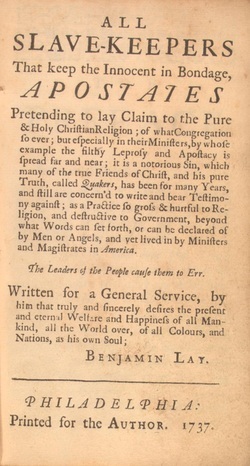 Benjamin Lay (1681–1760) was a Quaker philanthropist and abolitionist. Lay was born in Colchester, England. In 1710, he moved to Barbados as a merchant, but his abolition principles, fueled by his Quaker radicalism, became obnoxious to the people who lived there so he moved to Abington, Pennsylvania in the United States. In Abington, he was one of the earliest and most zealous opponents of slavery. Lay was barely over four feet tall and wore clothes that he made himself. He was a hunchback with a projecting chest, and his arms were almost longer than his legs. He was a vegetarian, and drank only milk and water. He would wear nothing, nor eat anything made from the loss of animal life or provided by any degree by slave labor. He was distinguished less for his eccentricities than for his philanthropy. He published over 200 pamphlets, most of which were impassioned polemics against various social institutions of the time, particularly slavery, capital punishment, the prison system, the moneyed Pennsylvania Quaker elite, etc. Refusing to participate in what he described in his tracts as a degraded, hypocritical, tyrannical, and even demonic society, Lay was committed to a lifestyle of almost complete self-sustenance. Dwelling in a cottage in the Pennsylvania countryside, Lay grew his own food and made his own clothes. His passionate enmity of slavery fueled by his Quaker beliefs, Lay made the lives of his slave-owning Colonial co-religionists a living nightmare with a constant stream of tracts, rants and stunts. He burst into one meeting of Philadelphia's Quaker leaders and plunged a sword into a hollowed out Bible filled with blood-red pokeberry juice, which he then sprayed in the shocked faces of the slave-owners. In another event, he dressed up as a Black Man. When he entered the Quaker Meeting, he began to whip the Quaker Leaders to show how the slaves felt. Although he was quickly banished from the meeting, the commotion he greatly offended the Quaker Leaders. 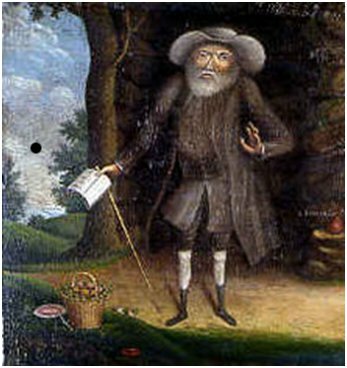 Benjamin Lay died in Abington, Pennsylvania, in 1760. His legacy continued to inspire the abolitionist movement for generations; throughout the early and mid-19th century, it was common for abolitionist Quakers to keep pictures of Lay in their homes. Benjamin Lay was buried in the Abington Friends Meeting graveyard located atAbington Friends School in Jenkintown, Pennsylvania.